Above we have an ASA firewall on the left side, there’s a remote VPN uses that connects to our firewall. This remote VPN user is not using split horizon so all traffic is being tunneled to the ASA. Let’s say this user wants to reach some webserver (2.2.2.2) on the Internet behind R2. Our traffic will enter the ASA on its outside Gigabit 0/0 interface and exits the same interface. By default, the ASA will drop this traffic. The second issue with this setup is that the source IP address will be from the 192.168.10.0/24 subnet. Since this is a private range, R2 will drop the traffic when it has to be routed to the Internet. We need to configure the ASA to permit traffic that enters and exits the same interface. Traffic from the 192.168.10.0/24 subnet has to be NAT translated. Nice Article . Please carry on . STATIC is a one to 1 mapping ie public 8.8.8.8 maps to private 10.10.10.1 all the time. 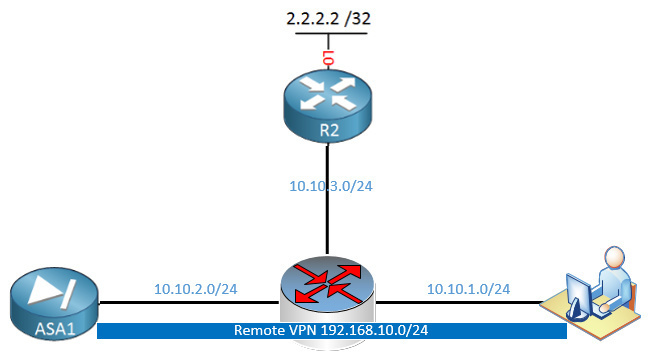 DYNAMIC would be used if you had multiple connections that needed to be NATTed as you can then define a range of IP addresses using an access list and when a NAT translation needed to be made, then it would use a free public IP address from the access list.